During the summer months, people gather on the Terrasse Dufferin in Old Quebec City, Canada to watch street performers, learn the history of the area, enjoy the scenery, stroll the boardwalk and admire the beauty of the Fairmont Le Chateau Frontenanc. Standing on a cliff overlooking the Gulf of St. Lawrence, the accommodations at the Fairmont Le Chateau Frontenanc are luxurious. 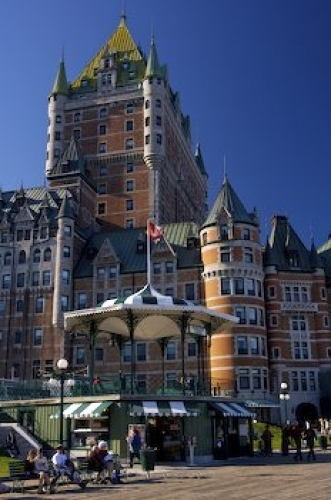 Photo of the Fairmont Le Chateau Frontenac, beautiful accommodations in Old Quebec, Canada. Centrally located, the Fairmont Le Chateau Frontenac offers guests some of the best accommodations, restaurants, shops, entertainment and scenery throughout the city. Staying at the Fairmont Le Chateau Frontenac creates the ideal atmosphere and positive attitude, starting one's vacation off in the right manner. Fairmont Le Chateau Frontenac, Chateau Frontenac and Terrasse Dufferin in Old Quebec, Quebec City, Quebec, Canada. UNESCO World Heritage Site.